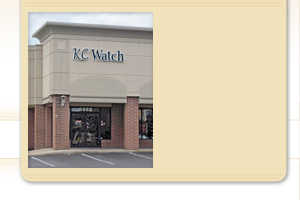 Please feel free to contact us or stop in with any question regarding your watch, clock, or jewelry, and we'll try to accommodate your needs. Hopefully our convenient store hours easily allow you to come in, dropoff, or pickup during the workday, afterwork, or on Saturday. Please give us a call or send us an email for any inquiry, and we can see if we can help. We're located at the Southwest corner of 95th and Antioch, just East of i-35 and West of i-69. "Great service. Prompt, courteous, honest and know what they're doing."